Who is involved: ProfundaMente is an association recognised as a private social solidarity institution which aims to study and support older people. In 2012 the organisation won an EFID award, for giving value to the capacities of those diagnosed as having dementia through various activities. The Jury of the EFID awards recognised the value of its twofold objective: firstly to enable people diagnosed with dementia to regain their self-esteem; and secondly to change the representation associated with dementia. Partnerships with the museums and gardens of Lisbon were seen as particularly encouraging in achieving the second objective. Nature of activity: The main project focuses on the loss of identity that can occur when someone is given a diagnosis of dementia. The person themselves can develop low self-esteem. Rebuilding self-esteem is the overall aim of the organisation, by providing more autonomy and developing old and new capabilities, even if the person’s thinking is less clear. Oficinas Terapêuticas is a project that began in 2004, in a private institution in Lisbon. 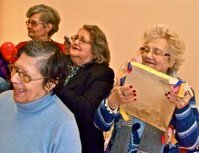 Oficinas Terapêuticas, or therapeutic workshops, are small units of therapeutic intervention based in the community, that use community structures, preferably linked to primary health care, and develop programmes for people with Alzheimer’s disease or related diseases. The work of the project is carried out with the therapeutic intervention of a number of artists and artisans and with the collaboration of community organisations.